Specially designed to be built by beginners over the four days of the BOATS 99 boat show, although Sandpiper reduces boatbuilding to its simplest elements she is a good-looking rowing and sailing skiff – her bilge keels give her a spacious and unobstructed interior. 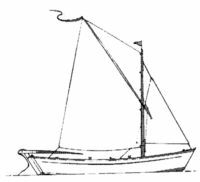 Choice of rigs: spritsail sloop, as seen here, or standing lug. Sandpiper illustrates the principles of “handsome is as handsome does”, since the main considerations in her design were speed and ease of construction – but the outcome was a capable and attractive little boat. Her hull is formed simply by bending parallel-sided panels around prefabricated frames, and adding strength and stiffness with solid chines and gunwales. She is built from four sheets of 1/4″ (6mm) ply, with solid timber as required for framing and longitudinals. Instead of the usual centre- or dagger-board, Sandpiper has twin long bilge keels which give her windward performance in very shallow water, as well as an unusual amount of space within the boat. Her light weight means she can very easily be trailed to the waters of your choice, and for the single-hander she makes a simple weekend cruiser if fitted with a tent cover. Two adults can comfortably spend the day aboard exploring out-of-the-way places generally accessible only to wildfowlers in long thigh boots. Particularly full and detailed building instructions are accompanied and illustrated by copies of the article on Sandpiper from “Practical Woodworking”, the magazine sponsoring the event at Boats 99 where the first examples after the prototype were built.